“With its Veyron and Chiron super sports cars, Bugatti has established a position as a pioneer for new technical developments and innovations in the extreme performance sector of the automotive industry over the past few decades and has set breathtaking performance data and records. Now the Development Department of the French luxury brand has achieved a new coup. For the first time, the Bugatti developers have succeeded in designing a brake caliper that can be produced by 3-D printing. But that is by no means all. 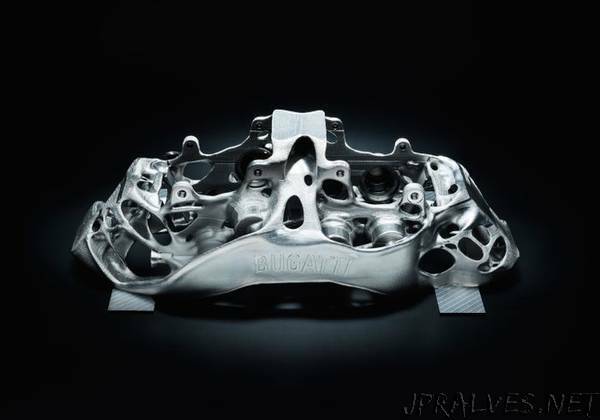 While the main material used for the additive production of vehicle components to date has been aluminium, the new brake caliper is made from titanium. This is therefore the world’s largest functional component produced from titanium using 3-D printing processes. This new milestone in the development of 3-D printing was reached in cooperation with Laser Zentrum Nord of Hamburg, an institute that has formed part of the Fraunhofer research organization since the beginning of the year. With this world debut, Bugatti has underlined its lighthouse function for 3-D printing within the Volkswagen Group and its role as an innovation driver in the international automotive industry. Vehicle trials for the use of the 3-D titanium brake caliper in series production are to start in the first half of the year.